“You look like you need a l’chaim,” the yeshiva bocher said to me, extending a plastic cup in one hand and elevating a bottle of vodka in the other. “No, I can’t, it’s OK,” I replied, but he was insistent. “I know a little about people and I can tell that you, my friend, are really in need of a shot,” he continued. He started to pour. He looked at me puzzled and I could tell he’d had a few drinks of his own already. “But … it’s Shabbos!” he sputtered, then slumped onto the couch dejected before being distracted by the eye-popping scenery all around the two of us. We were at the 12th floor rooftop pool of the Ritz-Carlton Hotel in Herzliya. His black and white Shabbat garb was no match for the ever-changing color parade of half-naked men and women in their swimsuit finest. I could have told my interlocutor why I was turning down his offer – that alcohol and chemotherapy don’t mix so well for me – but that would have gone against the aim of this weekend. My wife Jody and I had slipped into the Ritz-Carlton “cancer incognito.” We did it with the help of the wonderful Refanah organization. Refanah is an Israeli non-profit that provides much needed “healing holidays” to people suffering from cancer. Refanah founder and executive director Robyn Shames has convinced dozens of hotel, B&B and guesthouse owners around Israel to donate sleeping accommodations based on the property’s availability. Refanah’s pitch to proprietors is that they already don’t run at full occupancy year-round, especially during the week. So donating a room for a night only really costs them the cleaning afterward. According to the Israel Central Bureau of Statistics, there are 6,500 B&B rooms in Israel with an average occupancy rate of 50 percent on weekends and just 25-30 percent during the week. There are another 50,000 hotel rooms with an average occupancy of 55 percent. Shames came up with the idea for Refanah in 2014 after a relative, who had survived cancer, told Shames about Cottage Dreams, a similar program in Ontario, Canada. Shames had already been doing important work as the executive director of ICAR, the International Coalition for Agunah Rights, fighting to “unchain” women whose recalcitrant husbands were refusing to provide them with a get, a divorce decree according to Jewish Law. After 11 years at ICAR, she was looking for a change. But it had to be one where she could continue doing good in the world. Shames started her Refanah by randomly contacting some 100 Israeli B&B owners to gauge interest. She figured maybe 10 percent would say yes; almost half agreed immediately. “People are very excited about having this opportunity to do something nice,” Shames says. In our case, the room at the exclusive Ritz-Carlton Hotel, overlooking the picturesque Herzilya Marina with its hundreds of yachts and sailboats, was owned by an individual who vacations in Israel the summers. The hotel generously added breakfast to round out the weekend. People with cancer can browse the Refanah website to view properties and read details about availability. Refanah collects a modest NIS 100 fee when you make the reservation, “thus enabling every cancer patient to help others by participating in their circle of giving,” Shames says. Both people undergoing cancer treatment and those who have finished treatment in the past year are eligible. 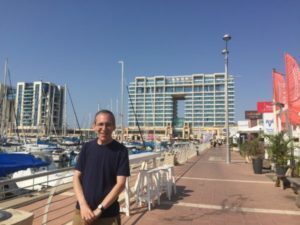 There are Refanah properties all over the country – on kibbutzim; smack dab on the beach; in the centers of Jerusalem, Tel Aviv and Eilat; in a stark caravan overlooking the Sea of Galilee; and even on an alpaca farm outside of Mitzpeh Ramon. Refanah is great for people with cancer, but it’s good for property owners, too: a free night generates positive publicity that can lead to referrals and future business. Despite the number of properties working with Refanah, the demand is constantly growing: about 28,000 people are diagnosed with cancer each year in Israel. Refanah has now provided free vacations for nearly 2,000 cancer patients and their families. For Jody and me, it was not just the break from routine in a pampering seaside hotel that was so invigorating. It was also the anonymity: no one knew how we got there or why. Maybe there was something small written on our reservation form, but to everyone else, we were just two ordinary guests. For someone like me who’s been so public about his cancer experience, going incognito was as refreshing as that rooftop pool (which my doctor told me I was not allowed into because, you know, germs). It’s not so surprising, then, that I chose not to tell my new yeshiva buddy the reason I was so resistant to his vodka volunteerism. Nor could he have surmised on his own my status – my hair hasn’t fallen out from the chemo (although my hairdresser says it’s thinned a little) and I’ve actually gained weight (treatment makes me crave carbs). But someday – hopefully soon – I might just take him up on his Shabbos shots offer. L’chaim right back at ya. I first got healed by Refanah at The Jerusalem Post.